This page features several souveniers that you can purchase through this "Autodelta Golden Years Team" website. We will ship to EEC countries at a slight additional charge. There will be no additional charge for shipping within the Continental United States. 100% of the proceeds will revert to the cost of maintaining this website. No profit will acrue to the editor or the editorial contributors of this "Inside the Walls" website. 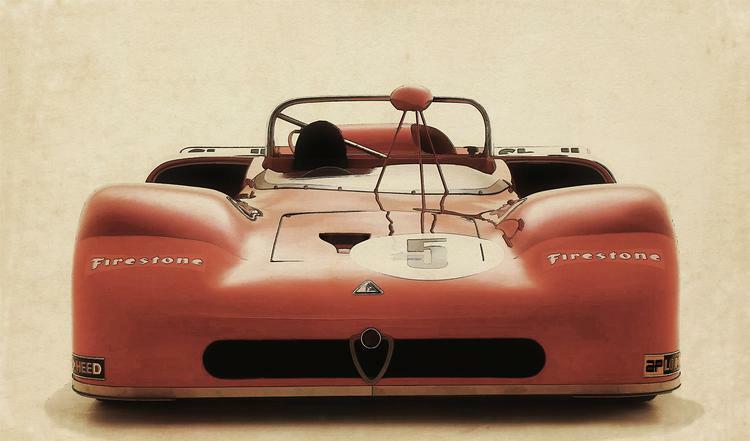 Diese John Barnes-Lithographie wurde von Alfa Romeo, Inc. (USA) nach dem Gewinn der Markenweltmeisterschaft durch den Tipo 33TT12 in Auftrag gegeben. Ich habe noch einige dieser originalen, signierten Lithographien von Team, Fahrern und Ing. Chiti zum Verkauf an Sammler. Diese Arbeit ist vielleicht auch insofern bemerkenswert, als Mr. Barnes den Namen des deutschen Wurstherstellers und Team-Co-Sponsors "Redlefsen" auf dem Panel vor dem Fahrer falsch geschrieben hat! Questa non fa parte delle foto alle pareti dell'Ing Chiti, ma piuttosto un suo ricordo autografo espressamente per me. 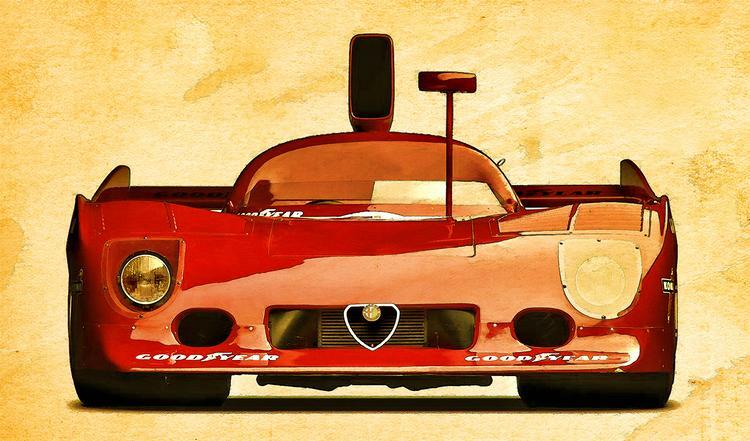 Questa cartolina, con litografia di John Barnes, fu commissionata da Alfa Romeo USA in occasione del trofeo Mondiale Marche Costruttori del 1975 vinto dalla Tipo 33TT12. Di questa cartolina ho diversi esemplari autografati da Chiti e dai piloti; in vendita per collezionisti. Da sottolineare l'errore ortografico commesso da John Barnes relativamente al nome della Ditta tedesca e co-sponsor “Redlefsen” sul cofano davanti al pilota..! 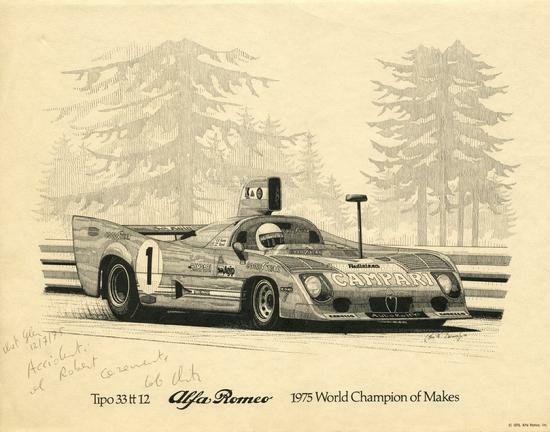 This John Barnes lithograph was commissioned by Alfa Romeo, Inc. (USA) upon the occasion of the Tipo 33TT12 capturing the 1975 World Championship for Makes. I have several more of these signed lithographs by the team, drivers and Ing. Chiti for sale to a serious collector...framed or unframed. This work is perhaps noteworthy also in that Mr. Barnes mis-spelled the name of the German sausage maker and team co-sponsor "Redlefsen" on the panel ahead of the driver.! Appropriately framed, matted and placed behind anti-glare glass...or unframed. Please inquire to Robert Little at Paralegal123@msn.com for further information about acquiring this valuable historical asset. Original art of Ing. 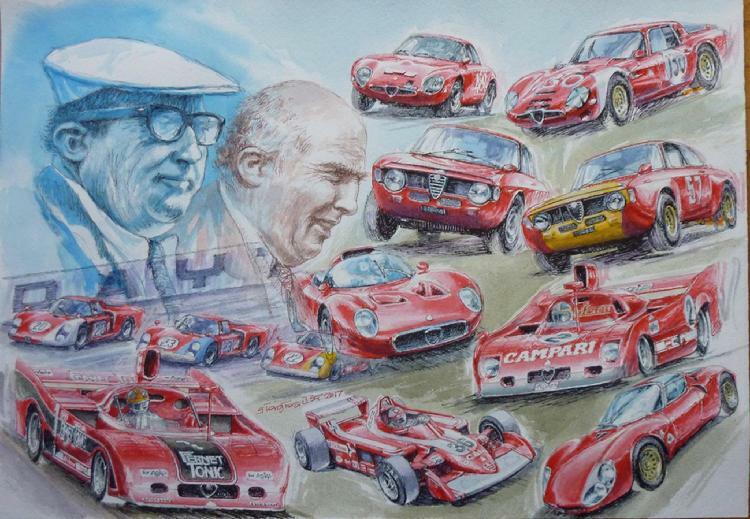 Carlo Chiti's accomplishments provided the courtesy of Italian artist Mr. Giorgio Alisi of Italy. 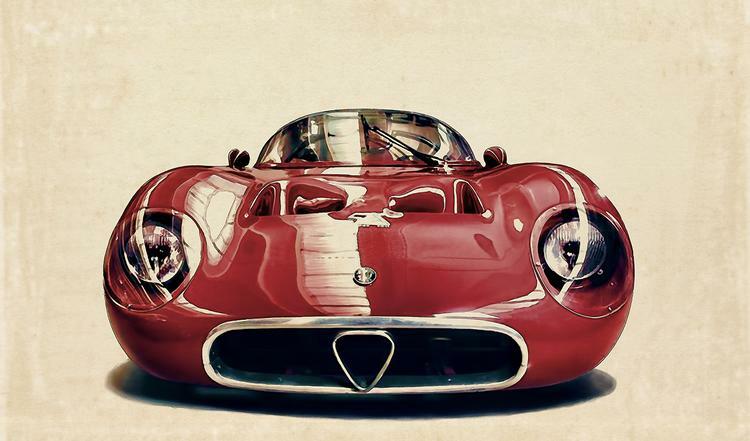 This single stunning historical piece is for sale directly though the artist. "The Art of the T-33 by Vladimir Pajevic"
In lithographic form...reproduced in the highest resolution .tiff format and printed on the finest 300 + gr. cotton weave paper...each print will be mailed to you in a hardshell-sealed tube... anywhere in the Continental United States for $75 each image... two images for $140, three for $205 or all four for $265 USD. 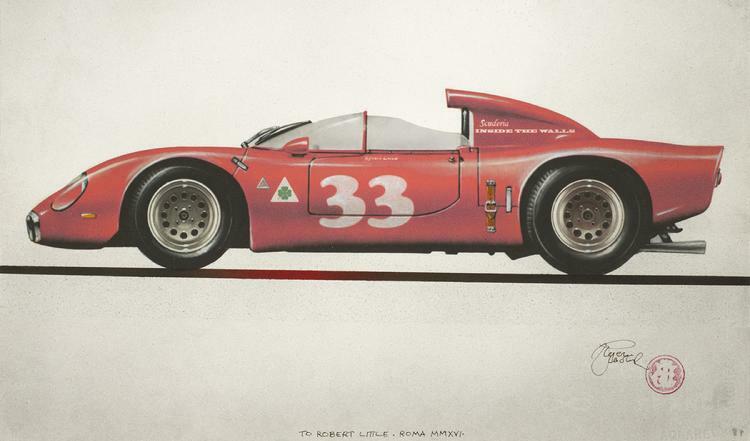 The actual size of each original lithograph is approximately 11 " x 18 " or 280 mm. x 457 mm. If you desire any of the four versions with a somewhat glossy finish, the price for each 11 "x 18" image size is $55.00 postage paid. A larger proportionate size of your choosing can be created at an additional charge. Please inquire with our editor. Remember that all profits are directed to help pay present and future domain name and hosting fees established Network Solutions, Inc.